Fire Facts: The majority of wildfires are burning in both Arizona and New Mexico. As of today’s date, there have been 27,943 wildfires in the United States with 2,577,417 acres destroyed versus 2016’s 23,862 fires and 1,969,965 acres. And, things are beginning to dry out even more. Furthermore, lightning strikes are igniting many of the wildfires while some are human-caused. 303 FIRE (NEW!) – 4 miles North of the Phoenix Metropolitan Area. This wildfire is South of the Carefree Highway and North of the Phoenix Sonoran Preserve near the Intersection of I17 & Loop 303. Fire fuels include hot and dry brush. This fire was ignited today @ 1400 hours. BOUNDARY FIRE – 12 miles North of Bellemont. Moderate fire behavior with backing, flanking and torching. 10,344 acres. 42% contained. Structures threatened. The Encino Fire is located in SE District in the AZ Dept. of Forestry area. Fire fuels include tall grass and brush. Extreme fire behavior with running and spotting. Structures are currently being threatened. 1,289 acres. 60% contained. 5 structures have been lost. 293 personnel. 6 crews. 39 engines. 3 helicopters. FRYE FIRE – Coronado NF. 9 miles West of Swift Trail Junction. Moderate fire behavior with single-tree torching, backing and creeping. Structures being threatened. 17,833 acres. 10% contained. 831 personnel. 21 crews. 36 engines. 7 helicopters. HIGHLINE FIRE – Tonto NF. 8 miles North of Payson. Minimum fire behavior with creeping and smoldering. 6,840 acres. 92% contained. 608 personnel. 8 crews. 35 engines. 5 helos. MAGGIE FIRE – Phoenix District Office. BLM. 6 miles North of Black Canyon City. Tall grass, brush and timber. Minimal fire behavior with 90% containment. 11 personnel. 3 engines. R-14 FIRE – Fort Apache Agency. BIA. 3 miles South of Cedar Creek. Timber. Human-caused and is under investigation. Minimal fire behavior with smoldering. 750 acres. 80% containment. 120 personnel. 5 crews. 1 engine. The Rain Fire is a newly reported fire that is located SW of the Grand Canyon airport on the Tusayan Ranger District of the Kaibab National Forest. The started today from an unknown cause. Fire fuels include pinyon-juniper woodlands. 154 acres. 40% contained. 80 personnel. 1 helicopter. 3 engines. 1 dozer and 2 crew. Smoke can be seen from the Grand Canyon National Park, Highway 164 and the town of Tusayan. Firefighters will hold the fire line and continue with mop-up operations. The Snake Ridge Fire is burning in a remote area on the Coconino National Forest, about 9 miles NW of Clintswell and about 10 miles SW of Happy Jack. 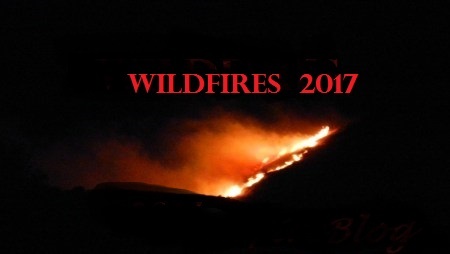 The fire was caused by lightning, called in by the Baker Butte Lookout on May 19, 2017. 15,333 acres. 100% contained. IMT 4. 20 personnel. We can also be found on Twitter ( @nwfireblog ) and on Facebook. Hope to see you all there!